My daughter couldn't be more excited about the new movie, so we decided to invite a few of her friends over for a My Little Pony Equestria Girls: Legend of Everfree Movie Night! The movie night is going to be a lot of fun and I'm excited to share our ideas and a FREE printable with you. There's also an awesome giveaway at the end of this post, so be sure to enter to win! After you've made your basic plans, the most important step to any party is to get invitations sent out! 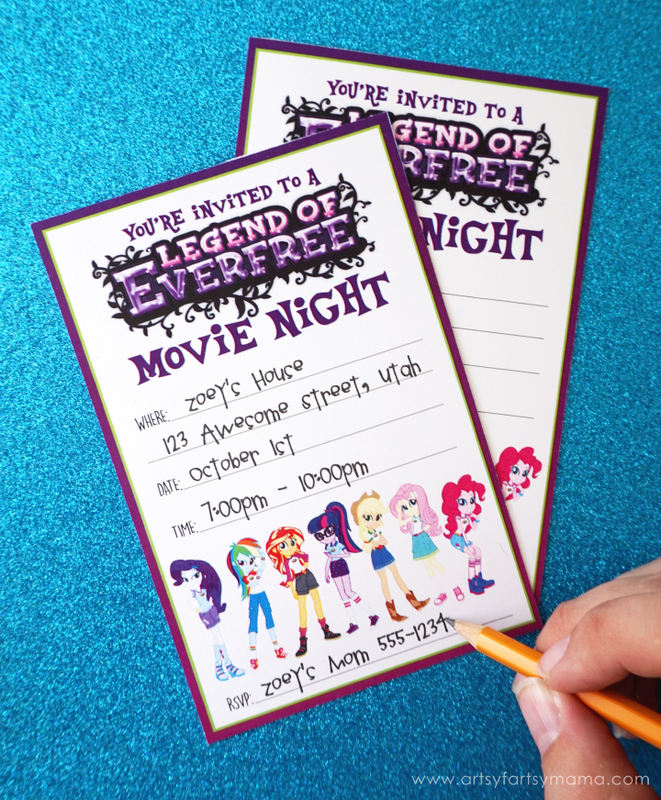 I've created some free printable My Little Pony Equestria Girls: Legend of Everfree movie night invitations that you are welcome to use for your own party. Print on cardstock, then fill in the information. Voila!! Since the movie is based in "Camp Everfree", I decided to bring a camping theme into the movie night. The girls will get to build a fort, and have blankets and pillows to snuggle in as they watch the movie on Netflix. 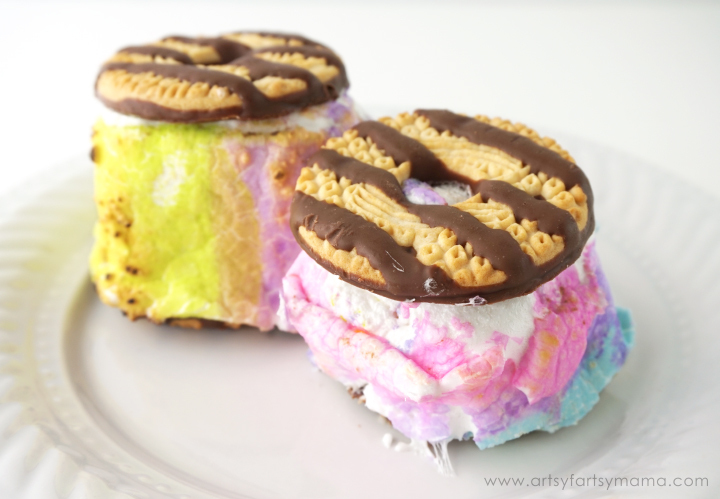 Along with popcorn, our party guests will also get to create some colorful Rainbow Magic S'mores!! 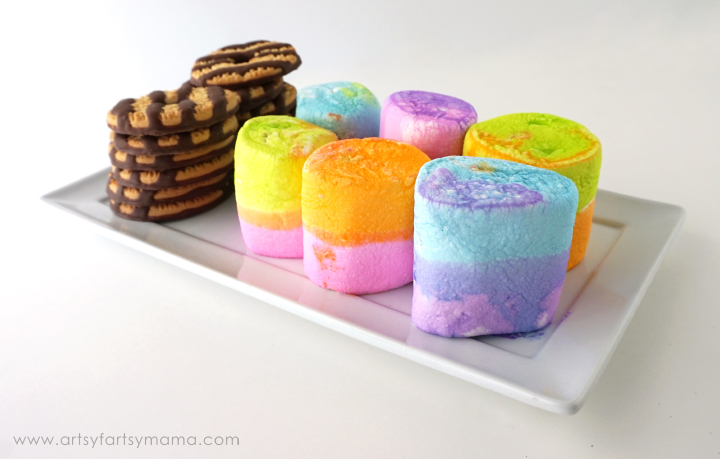 Getting the marshmallows to be different colors is easy peasy. In a small bowl, pour just enough water to cover half a marshmallow. Add in a generous amount of liquid or gel food coloring to the water and mix well. BTW - I really REALLY love how vibrant the neon set of food coloring is!! Obviously, mix each color in a separate bowl and create as many or as few colors as you'd like. 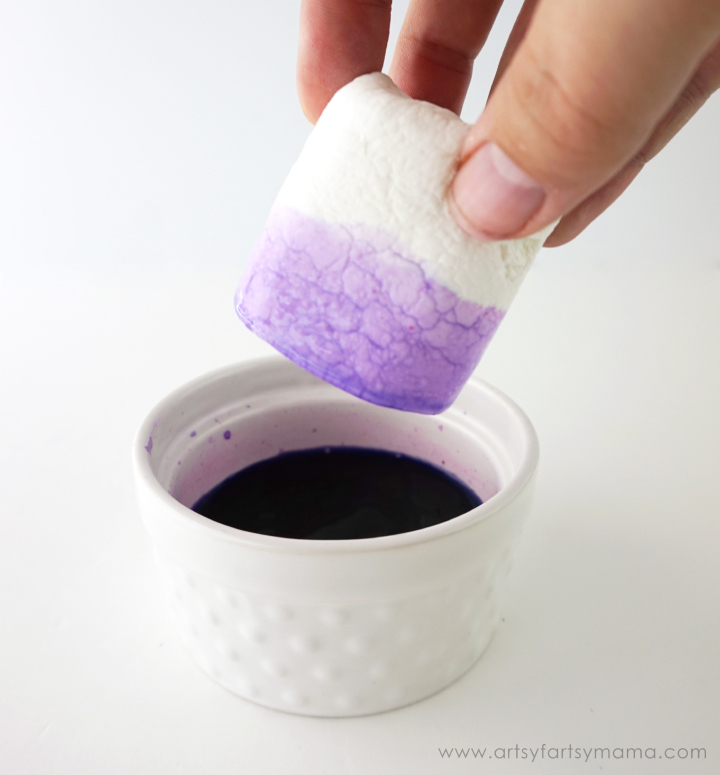 Grab a marshmallow and carefully dunk it into one of the colors and immediately pull it out and set it color-side up on a plate. Once it's dry, dip the other end into another color! If you don't want to wait for it to dry, you can also poke a toothpick into the wet end and dip it into the other color. I would recommend only dipping it into two different colors so you don't make the marshmallows too mushy. Let the marshmallows dry completely before turning them into s'mores! They will just be a sticky, gooey mess (not in a good way) otherwise. So, once they've dried, you can dump those marshmallows onto a plate to be transformed into a roasty, toasty s'more. To make things easier, I grabbed some fudge striped cookies to hold the marshmallows instead of the traditional graham crackers and chocolate pieces. The s'mores are colorfully delicious and are sure to be a hit at our My Little Pony Equestria Girls: Legend of Everfree movie night! 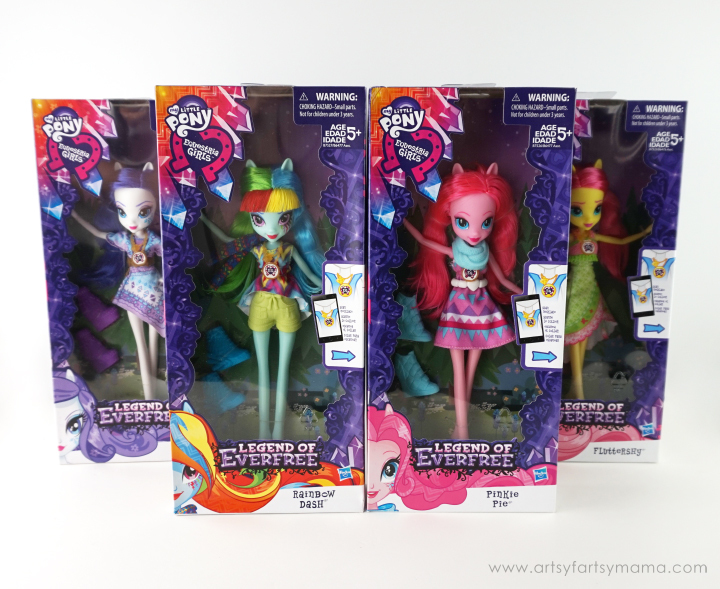 Last, but not least, we are also going to have some play time with some My Little Pony Equestria Girls: Legend of Everfree dolls including Rarity, Rainbow Dash, Pinkie Pie, and Fluttershy who want to put their best fashion forward at Camp Everfree! 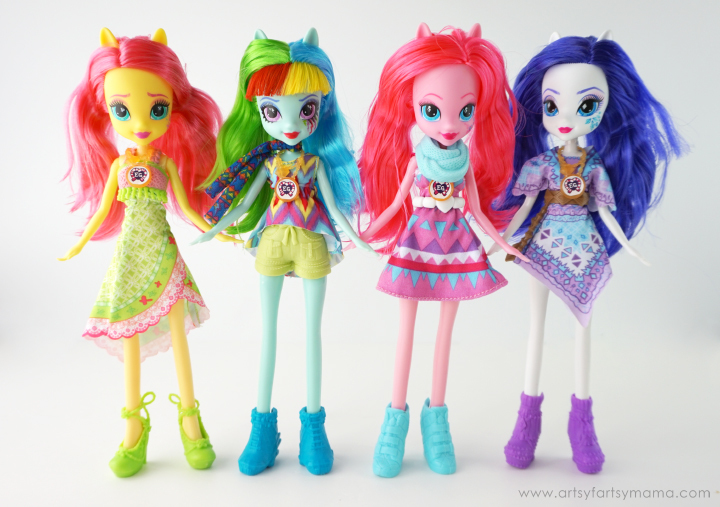 Each doll comes with a boho chic outfit, shoes, and a necklace that can be scanned to unlock more fun in the Hasbro My Little Pony Equestria Girls app like clothing, games or coins. The dolls are available at most major toy retailers nationwide and on HasbroToyShop.com. I hope you've gotten as excited as we are about the new My Little Pony Equestria Girls: Legend of Everfree movie coming to Netflix on October 1st! These dolls are adorable and the girls are going to have a blast playing with them this weekend! Rainbow Dash is our house holds absolute favorite! How adorable! Luci is so excited for this to come to Netflix! And your treats are perfect. Luci's favorite is Pinky Pie...but she's also a fan of Rarity. "It's so hard to pick, mom!" Lol! Hands down, my favorite is Pinkie Pie! She's basically me as a pony: pink, Baker/caterer/party organizer, hilarious, excited, and fun! Equestria girls is a favorite here. Bai will be sooo excited that it will be on Netflix. I can't wait to tell her. :) the invitations are adorable!! We like Fluttershy at our house, and I love the invites.... and that idea to color the marshmallows is awesome, I plan on trying that soon! My girls' favorites are Rarity and Pinkie Pie! Love the marshmallows!